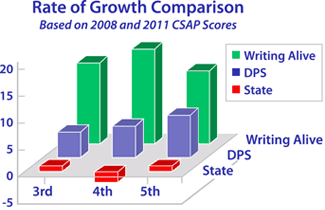 By equipping teachers, student writing and test scores soar! Achieve growth and success for your school with the Writing Alive Professional Development Plan. 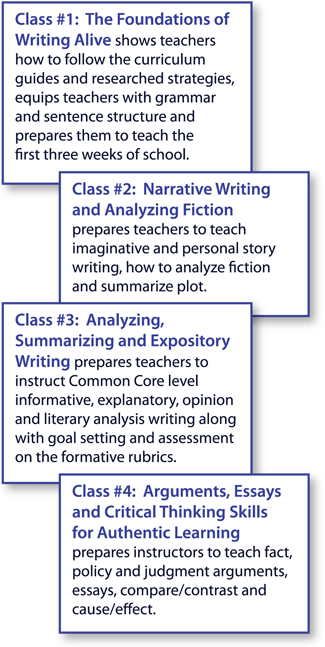 In-depth graduate level classes equip educators to understand writing at a deeper level and integrate all six components of writing into their instruction. Writing Alive instruction for teachers is by teachers who have used the curriculum for many years and are eager to share their success. 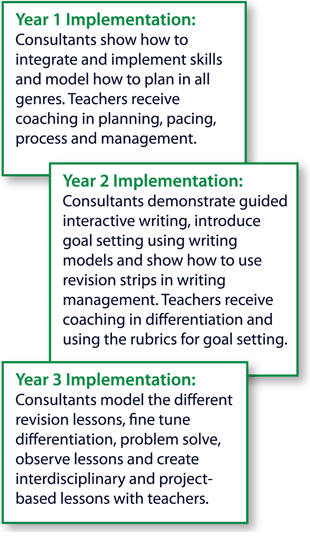 In order to prepare teachers with an understanding of Writing Alive and all the foundational skills and researched learning strategies, teachers need three core classes year 1. Intermediate and middle school teachers need the fourth class in year 2 (or they may schedule it in year 1). Separate primary, intermediate and middle school classes address developmental levels. When teachers become experts on the Common Core Language Standards, Writing Standards, Reading Literature and Nonfiction Standards, they can confidently prepare their students for writing success. For further explanation, here is a link to Writing Alive’s article in SEEN (Southeastern Education Network) magazine titled “Fulfill the Dream – Getting Teachers Plugged In." Research shows teachers need 3-5 years of development and support to internalize new learning. 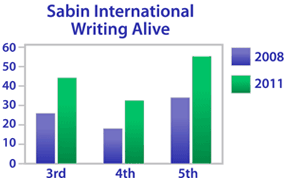 Writing Alive provides on-site grade-level lesson modeling and coaching to sharpen instruction. Experienced Writing Alive teachers model lessons in the classroom with the students and observe lessons to help teachers grow. For three years, from planning to revision, teachers receive the coaching and support they need to fully implement the curriculum. Writing Alive selects and trains highly qualified teachers to become in-house Writing Alive experts. This ensures the writing curriculum is practiced with fidelity, so students and teachers reach their potential. Writing Alive also prepares administrators and parents. A primary, intermediate and middle school teacher is selected to receive further Writing Alive training to support their school’s staff. Principals benefit from a complimentary class that prepares them to administer Writing Alive. 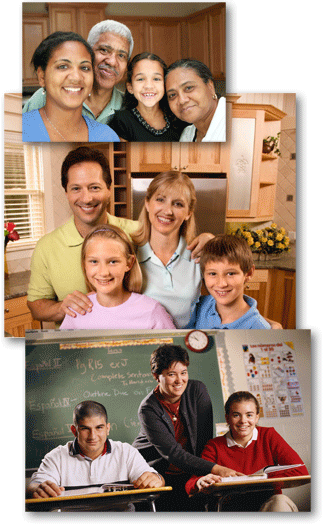 A complimentary parent class prepares families with a common language and activities they can use to support their children at home. When parents understand and participate in Writing Alive, they support the teachers and their children. Writing Alive’s mission is to prepare teachers, administrators, students and parents with the tools they need to be confident in writing, skilled in communicating and prepared to analyze what they read.